I've got a poem in the new issue of Alimentum. Worcester is in the house. Fall River is in the house. 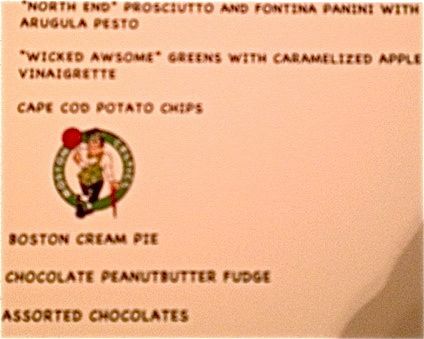 Go Celtics! Back from Rochester where we were watched over by Sister Carolyn and her boyfriend (pictured). While there we got to eat once again at Don's Original, Sea Breeze--best cheeseburgers I've ever had. Just got back from the Tennessee Williams Lit Fest in New Orleans. Taught a master class in novel writing that was a real treat. A packed house. On Friday I met with 200 city high school students at Le Petit Theatre. We talked about secrets for a while. How they might become stories. They were more than forthcoming. One young woman told us that every night for the past two weeks she'd been waiting for her mother to fall asleep and then took the car and drove around town. Another girl confessed to feeding her goldfish Froot Loops and injecting it water from a hypodermic needle--her mom was a nurse. When we weren't at the fest we were eating--this is New Orleans! Oysters at the Acme Oyster House, which is celebrating its 100th anniversary this year. Oysters and an Abita Amber. We always make our way to Cochon. Ate there our first night. I had fried boudi. The pig ears weren't on the menu that night for some reason. We lunched at NOLA on Friday. Sat at the chef's counter here as we had at Cochon. Love watching the food get made in the wood fired oven. Hickory roasted beef brisket--wonderful. We took the streetcar way out St. Charles and had dinner at Brigtsen's, a cozy littel restaurant in an old house. We ate in the living room. We shared catfish, rabbit, oysters, shrimp, crabmeat, and drum. And, of course, we had coffee and beignets at Cafe du Monde. Much to our surprise, the Roadfood Festival appeared right outside our hotel in the Quarter. We changed our minds about lunch at Bayona and hit the streets. Seafood chowder from the Maine Diner--a place we've stopped at every time we driven to Maine. What a treat. We had crawfish pie from Lasyone's. Just as good here as at their Natchitoches restaurant. There was a long line at the Louie Mueller barbecue tent. The restaurant in Taylor, Texas, is legendary, but we never made it there while we were living in Austin. We ate the best brisket we've ever had at that tent! (Sorry, Emeril.) So moist it melted in your mouth--no sauce necessary. Then we had spicy hand-cut fries at The Que Crawl, the city's roving purple restaurant, and buttermilk pie from Royers Round Top Cafe. There was plenty more we wanted to eat--five blocks of tents along Royal Street, but we were stuffed and had a plane to catch. I want to do that again! Today's short story waiting to be written comes from Pasadena, Texas. Authorities say a Houston-area woman who was burned up at her former common-law husband fried their pet goldfish and ate some of them. Pasadena police say it's a civil matter and no charges will be filed. The seven goldfish were purchased together by the couple during happier times. Police spokesman Vance Mitchell says the man reported on Saturday that the woman took the goldfish from his apartment. Mitchell says the two argued earlier about some jewelry the man had given her but took back. She wanted the jewelry returned. Dania Beach, oldest city in Broward County, was once the "Tomato Capital of the World." Salt-water incursion put an end to that dream.The tomato industry has moved west to Immokalee. Nearly all the tomatoes available in national supermarkets in winter come from here in South Forida.Those tomatoes are generally thick, dry, and tasteless. 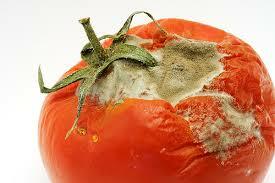 In fact, I haven't had a decent tomato in twenty years. But that's not the real problem. Gourmet magazine's March issue features a story on slavery in the tomato fields of Immokalee. It's well worth reading about the inhuman working conditions endured by migrant workers. 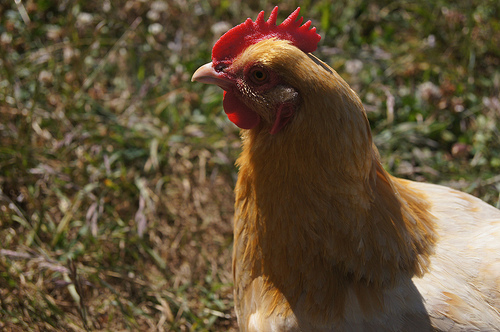 "Workers who pick the food we eat can't afford to feed themselves." And then find out how you can be assured that you buy slave-free fruit by checking the Coalition of Immokalee Workers Campaign for Fair Food here. I've got a lot of eating and reading to do. I forgot to mention a wonderful and busy London restaurant in my post earlier this week. 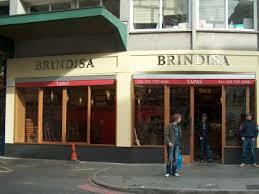 It's called Tapas Brindisa and it's beside the Borough Market and a short walk from the London Bridge tube stop. I had a spectacular grilled chorizo and among Jeannie D., James Bond (yes, I'm serious), Cindy, and me, we also ate fired potatoes, asparagus ham, pork fillet, chorizo omelette, picos (Monte Enebro goat cheese with almond), and chicken livers. All washed down with Cruzcampo beer for me, and wine for my friends. We had to wait an hour and a half for a table but found a nearby pub to have a pint. The wait was worth it. As Cindy says, No more bad food. Our pal Joe from Cheese (Queso, Tejas) wanted to know if we ate any great food in London, figuring no one would believe it if we did. We did, and here are the highlights. The Anchor & Hope pub in Southark near the Waterloo Underground was mobbed and noisy and we found out why. I ate fried sand eels, which reminded me of the majuas we get in Cuban restaurants in Miami--fried in a light batter and slightly spicy, spectacular; some of Jeannie's grilled razor clams; and roast pigeon and braised trevise, a bitter red Italian lettuce; Cindy and Jeannie shared a whole roast sea bass; John had a shrimp pot. The place was chaotic but our host James got us a seat in ten minutes after telling us we'd have to wait an hour and a half--maybe because lots of other frustrated and belligerant diners were giving him a hard time, and we were, of course, sweet. Cindy and I had lunch one afternoon at Chowki, just off Picadilly Circus. The restaurant features three cuisines from the Indian subcontinent: Pakistan, Calcutta, and Coorg. Three different cuisines of the thirty-six in India are chosen each month. I had Pakistani diced lamb tikka with spicy yogurt fennel marinade and from Coorg, fried sardines, and Cindy had a curried chicken stew. The bread was mator-chuti Kachoori, a deep-fried whole wheat bread stuffed with peas and spices--it was superb. On the last night in town after the ninth of our Shakespeare plays, Richard III, finished, we all went out to Soho for a meal at Arbutus. It happened to be our twenty-third wedding anniversary. Cindy and I ordered the risotto of garlic leaves, spring onion, and courgette (zuchinni), and it was simply the best risotto I've ever had. Creamy and savory. And we had a delicious Edinburgh-brewed Innis & Gunn oak-aged beer that was sweet, malty, with a slight whisky taste. (Whisky, not whiskey, since Scotch is spelled without the e.) You can eat well in London, but not cheaply. The gas was about $10 a gallon (where we in the States are headed; it's $4.00 at some area stations in South Florida) and some food prices have doubled in the last month, we were told. A pint of most beers in a pub averaged $7. 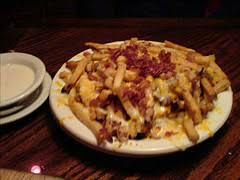 The worst: Outback Steakhouse Aussie Cheese Fries with Ranch Dressing! So bad that it beat out Bob Evans Caramel Banana Pecan Cream Stacked and Stuffed Hotcakes. What puzzles me is how KFC's Bowls of Fat didn't make the list. Speaking of food, Cindy and I stopped at a new Peruvian restaurant in the neighborhood last night after teaching. Seems to be called "Peruvian Food." I practiced my Spanish with our host. You can feed a family on one Peruvian entree, but we got three because I wanted to try the anticucho de corazon--grilled veal heart skewer. "Corazon? Verdad?" I said. "Si, es verdad." Y me gusta. So today for lunch I get to finsh the leftover chicharron de calamares. Next week we're going for the ceviche. Had lunch on Key Biscayne yesterday at the Lighthouse Cafe, place at the end of the island owned by the Gonzalez family. I ordered majuas because I'd never heard of it. Small whole fish lightly dredged in spicy flour and deep fried. Served with lime and tabasco--fabulous! David G. sent me this link to the little critters, jenkinsia majua.